Obama's Autopen 'Signing' Of Patriot Act Raises Eyebrows, Has Unlikely Ally : It's All Politics TOLPresident Obama's authorization of an aide back in Washington to use an autopen to affix his signature to the bill extending the Patriot Act while he's in Europe is being challenged by a Republican House member. But he seems to strong support for his actions from the Bush administration. 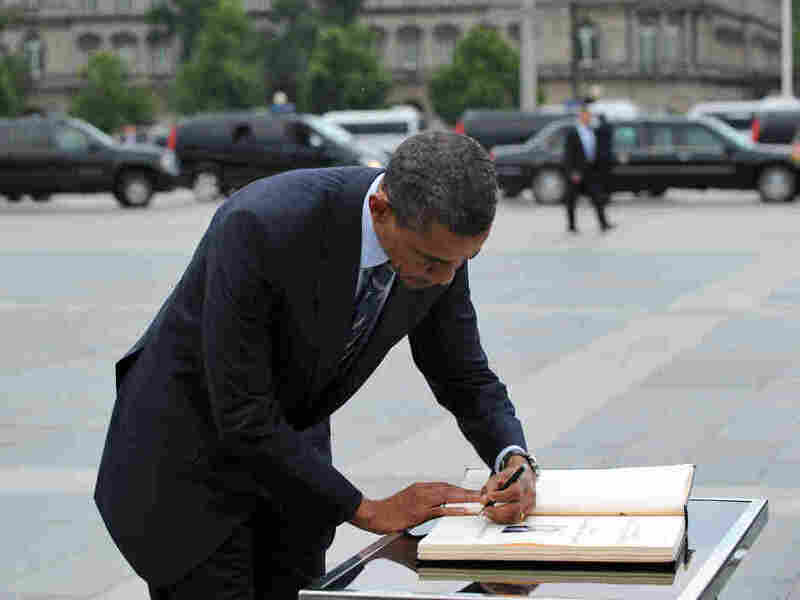 With his real hand in Europe, President Obama authorized the use of an autopen to sign into law the Patriot Act extension. President Obama's authorization of an aide back in Washington to use an autopen to affix the presidential signature to the bill extending the Patriot Act is is being challenged by some, including a Republican House member who sent a letter to the White House. But the president, who was in Europe at the time, has some sound legal backing for his use of the autopen (here's what some look like) to "sign" a bill into law and from an unlikely source, the President George W. Bush's Justice Department. Rep. Tom Graves of Georgia has written the president, who is near the end of his six-day trip to Europe, to request that Obama justify constitutionally his the use of the machine to put his signature onto the bill. It is apparently the first time in U.S. history this has been done. "Every Bill which shall have passed the House of Representatives and the Senate, shall, before it become a Law, be presented to the President of the United States; If he approve he shall sign it, but if not he shall return it with his Objections to that House in which it shall have originated, who shall enter the Objections at large on their Journal, and proceed to reconsider it." Mr. President, I write to request your confirmation that S.990, as passed by Congress, was presented to you prior to the autopen signing, as well as a detailed, written explanation of your Constitutional authority to assign a surrogate the responsibility of signing bills passed by Congress into law. The letter would seem to raise another constitutional question, one of the separation of powers and whether the president has to even answer the letter. Anyway, Obama can always point the congressman to a 2005 memorandum opinion from the Bush Justice Department's Office of Legal Counsel. Principal Deputy Assistant Attorney General, Office of Legal Counsel, Re: Signing of H.J. Res. 124 (Nov. 22, 2002) ("Whelan Memorandum"). We emphasize that we are not suggesting that the President may delegate the decision to approve and sign a bill, only that, having made this decision, he may direct a subordinate to affix the President's signature to the bill. The memo acknowledges that it has never been done and that White House's have gone to great lengths in the past to get legislation in the hands of presidents who were traveling abroad, just to avoid these questions. There was no time for that to be done in the case of the Patriot Act extension because it was passed by the Senate just before the midnight expiration of the law it was meant to replace. But it concluded that just because it hasn't been done doesn't mean it can't be done. It's just another of Washington's ironies that a memo by Bush administration lawyers comes to Obama's rescue.